Experience giving homage to the great Spirit of the universe, honoring the invisible stewards of nature, acknowledging the ancestors with generous offerings like steamed whole chicken, mounds of kakanin, fresh fragrant blooms and green bamboo containers brimming with native brew blessed by a babaylan. Relish the sweet air wafting with incense and smoke. Feel the space charged with primeval energy through the organic music resounding from skin drums, gongs, bells and bamboo instruments. Witness ancient dances being performed to purify the space represented by a mandala and join the small community of kindred souls gathering in an unbroken circle hoping and praying for healing, harmony and abundant harvests. All these may seem part of a tribal ritual in a remote Pacific island from a distant past. But this happened in 2013–on the 21st of September–right in the heart of ultra-modern Bonifacio Global City on the occasion of Earthdance Manila. The ‘island’ where the ritual for the Earth transpired at the urban oasis called the Arts in the City. There were healing sessions and seminars on health, spiritual philosophies, the art of the traditional Arbolaryo and Hilot and workshop in pangalay dance. Participants set up booths and exhibits on organic and fresh produce, vegetarian products, intricate jewelry fashioned from discarded materials, practical products recycled from tarpaulin material, mystical crystals and gemstones, books on Asian spirituality and many more. 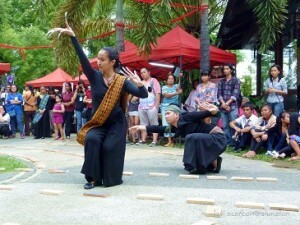 The AlunAlun Dance Circle’s participation in the Earthdance Manila 2013, through the invitation of festival organizer Ms. Rosanna Escudero, was a way to bridge the past to the present and to connect the sacred to the mundane. What better way to invoke the gods and spirits than through the ancient dance of our forefathers, for in beauty, one always sees the divine. Every slow gesture and passage of the pangalay articulated the desire of every participant or spectator to be united with the divine. Pangalay dancing allowed spectators to see the dance of their pre-colonial forebears from the Sulu Archipelago. The AlunAlun dancers there were not mere performers. They became conduits of the gods to mortals– modern day babaylans that keep the tradition alive through every exacting posture and graceful gesticulation, through every undulating movement, like waves ever gently lapping against the shore, and breathing in unison to symbolize wholeness. All these expressed awareness and oneness with Earthdance’s loftiest sentiment – PEACE! 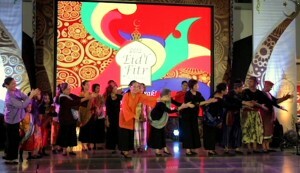 For two years in a row now the AlunAlun Dance Circle has been invited to celebrate with the Ed’l Fitr Festival at SM The Block in Quezon City. 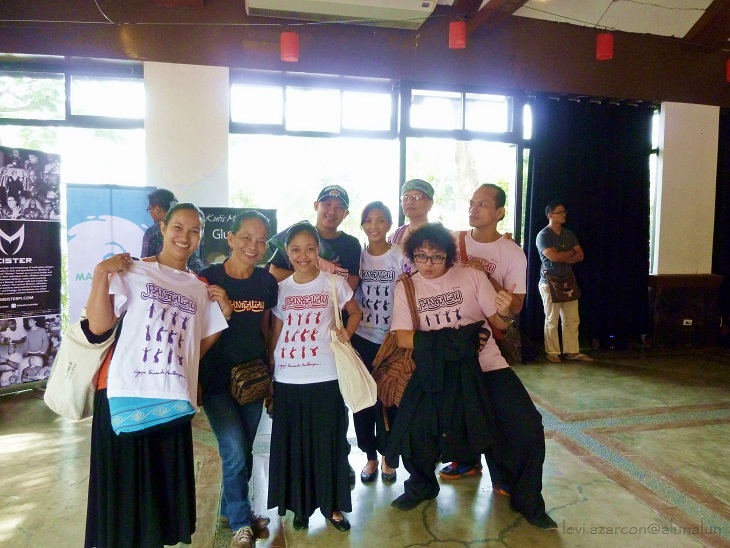 This year’s performance on 10 August 2013 was a grant from the National Commision on Culture and the Arts (NCCA) and sponsorship by the Magbassa Kita Foundation. Tauti is an occupational dance mimicking fishers catching catfish. 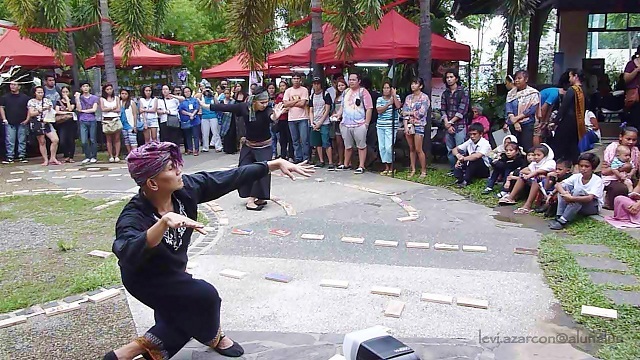 The concept of the show is very educational and celebratory, a fitting show for the Eid’l Fitr Festival — Konsiyerto ng Pangalay, mga sagisag ng ating lahi: AlunAlun Dance Circle popularizes filipino cultural icons in new choreography. 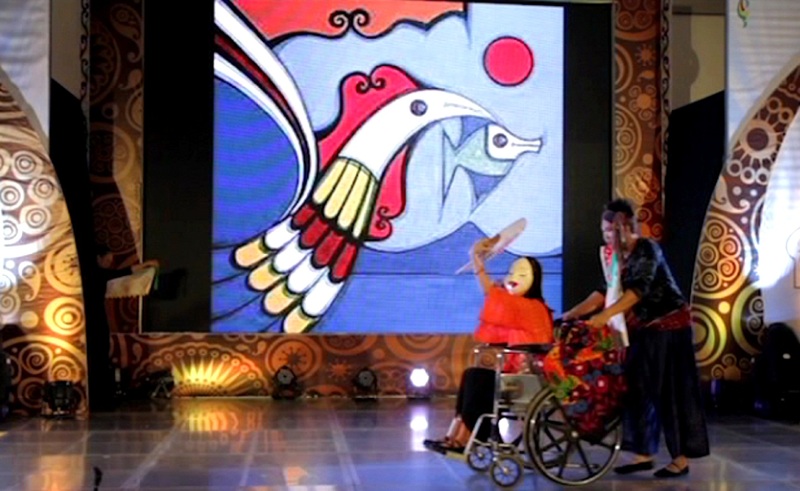 The show was structured around Philippine Cultural Icons, the pangalay being one of them. In keeping with the ADC tradition, the show began with a dance demonstration entitled ‘What is Pangalay?’ explaining why the dance, that is also called igal by the Sama and paunjalay by the Yakan, is a treasured Philippine intangible cultural heritage. The colorful patadyong/patajung or tubular piece of cloth is indispensable in the everyday life of the people in many parts of the Philippines and Asia. ADC dancers paraded on stage showing off the numerous ways of using it whether as a cradle, a head protection, a hilt for a sword, a shopping basket, a body garb, a sun shield, a belt, a fashion accessory, and so on. 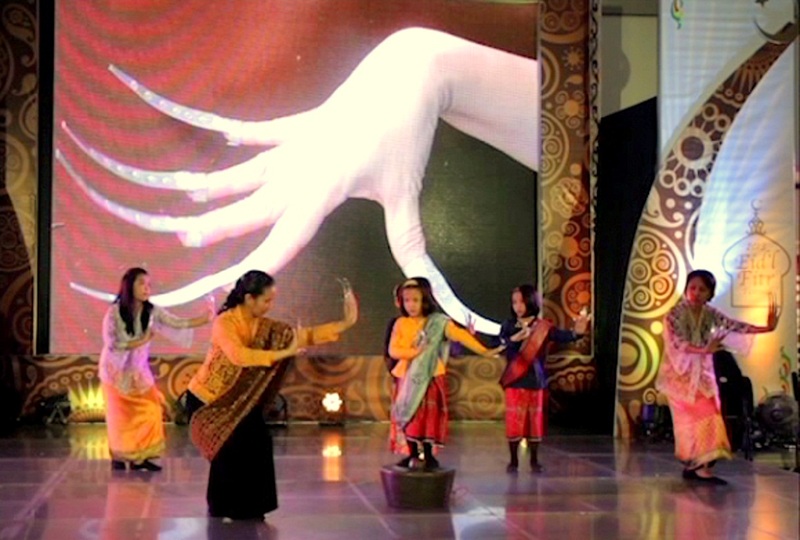 The janggay or metal claws, are interesting finger ornaments in dancing Pangalay. The janggay represents Philippine dance in much the same way as the toe shoe represents Western ballet. It is there an apt Philippine Icon and was chreographed with the young children wearing the janggay gleefully imitating a senior dancer. Then, one by one, they got on top of an agung, a huge knobbed gong, while dancing pangalay. A remarkable sight! The show featured intricately designed Laminusa tepo or banig from the Sulu Archipelago, vividly-dyed and woven in double layers. The playful chreography revealed a dancer coming out from a rolled-up mat. Then the mat was laid on stage like a carpet for the female dancer to dance onto. 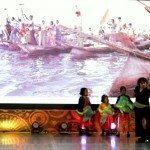 A second mat became the backdrop of a tariray dancer using bamboo clappers. Then the mats were furled out and waved furiously on stage by two male dancers to simulate how the Badjaw quarrel while out at sea, venting out emotions using the mats. 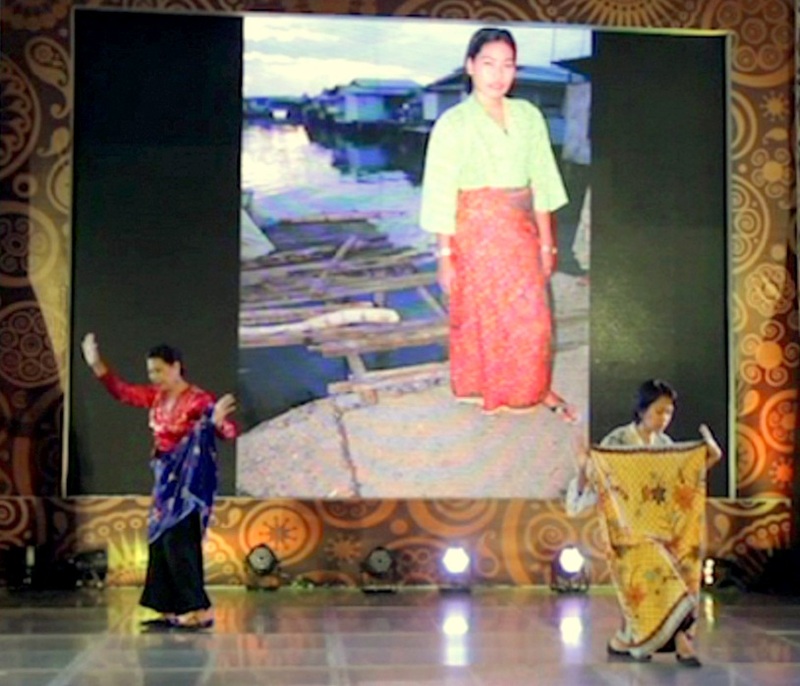 The lepa, or Badjaw houseboat, another vanishing Philippine Icon, was projected on the video wall while a group of male dancers danced the occupational dance called tauti, after children playfully glided as fishes on stage. A collaboration with a group of arnis practitioners was the final number of the show. They demonstrated graceful but ferocious moves as two competent fighters spar on stage. Meanwhile, a female sikado practitioner showed stances that looked more of a dance than a martial art. 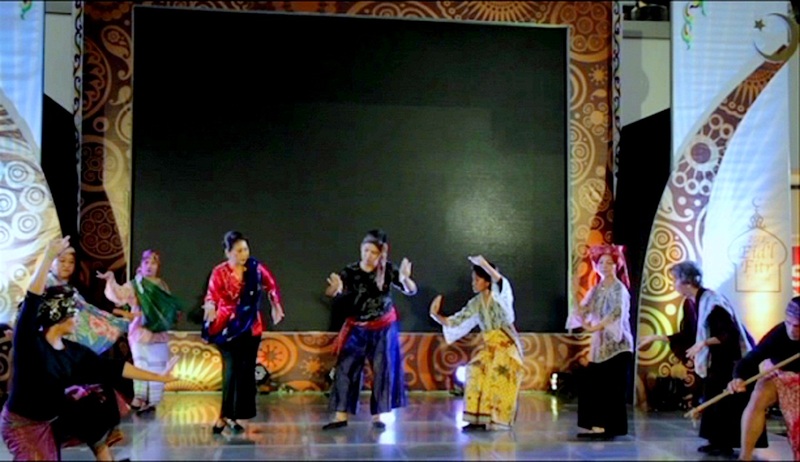 Sikado, a Filipino martial art from the Visayas, was performed in harmony with langka budjang, a martial arts for women in the Sulu Archipelago. The percussive sounds from the arnis sticks as they hit mounted rubber tires counterpoint with the bula-bula or bamboo clappers. The constant ‘kok-kak, kok-kak’ created by a line of dignified women dressed in black crossing in front of the audience off stage, their regular rhythm contrasting with the outbursts of the arnis, is a surrealist’s dream come true. We were enthusiastic to do a pangalay show for the Eid’l Fitr Festival with the Wadi family who hail from the Sulu Archipelago. The Wadi children and their mother, Joi, have been dancing with the ADC for more than two years now. Their father, Dean Julkipli Wadi of the UP Institute of Islamic Studies is a kulintangan player himself and an avid supporter of pangalay conservation. 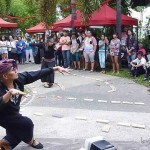 Not even the physical condition of our beloved Ligaya Fernando-Amilbangsa could deter her from celebrating Ed’l Fitr. Ligaya danced Igal Kabkab– which is her own original choreography based on the pangalay movement vocabulary–using a flirty fan. 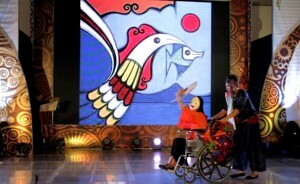 She danced the Igal Kabkab while seated on a wheelchair to show that persons with disabilities can still dance the pangalay. 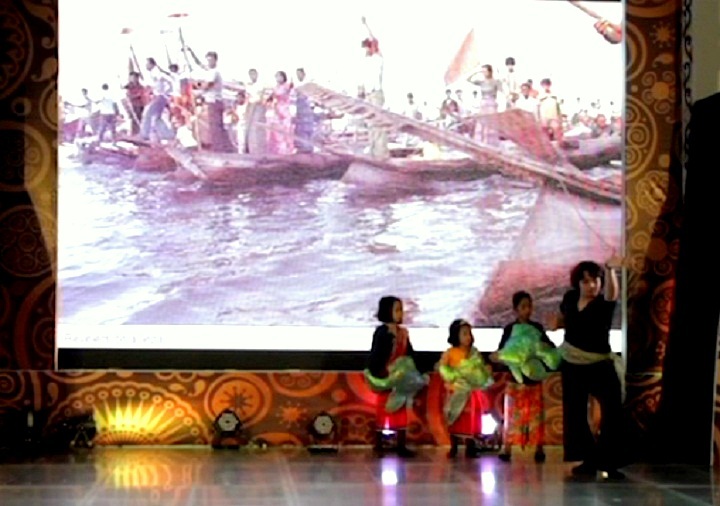 This is during the segment on ukkil that also featured the artworks of first Muslim National Artist Abdulmari Imao. Live kulintangan music lent a festive air throughout the show. As soon as the pangalay performance began, the mall audience became a big crowd as they watched from five storeys surrounding the majestic atrium of the SM The Block. The show ended with the audience wanting for more. 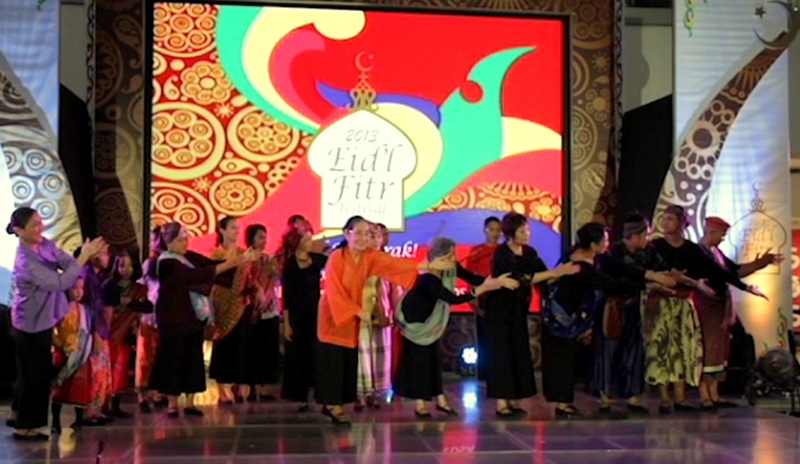 AlunAlun Dance Circle will always be united with the Filipino Muslim Community as proven by the Ed’l Fitr celebration year after year. This blog is exceptional. May I please know where one can get the metal fingers use in Pangalay dance please?